Chris Hinojosa, born with one arm but not a prosthesis user, tries on an early prototype for a modular socket that would accommodate single use extensions, like one for rock climbing or biking. Chris Hinojosa, an engineer born with one arm, always refused the “universal” high-tech artificial limbs that were made for him growing up. His body was more adaptive without machinic gear; instead, his workarounds for daily life are made possible with relatively simple adaptations and alternately choreographed physicality. When he first visited Investigating Normal in spring 2015, he showed us how he gathers his hair into a ponytail and dons a sterile glove in his work environment. Chris shows us in a video how he gathers his hair. Chris’s presence in an engineering class is a powerful corrective to the typical assumptions among young technically minded designers about disability. Not everyone is looking for a fix. Chris was game to collaborate, however, so he asked us to consider how he might perform a new, relatively inaccessible activity like rock climbing. He also challenged us to think hard about socket technology, which has been notoriously difficult to solve in all prosthetic limbs research—the fight against heat, moisture, and friction when machine parts meet flesh. Chris and students met at a local climbing wall to test out what he wants to be able to do and where the challenges lay. Two teams were formed: one for socket research and the other for the extension. It was a rapid prototyping process for both teams—seeking out existing precedents and trying divergent ideas for comfort and ease of use. Team socket was inspired by the physics of this compression model; they wanted to reverse-engineer something similar, but they also wanted their modeling, techniques, and fabrication to be open source and affordable. 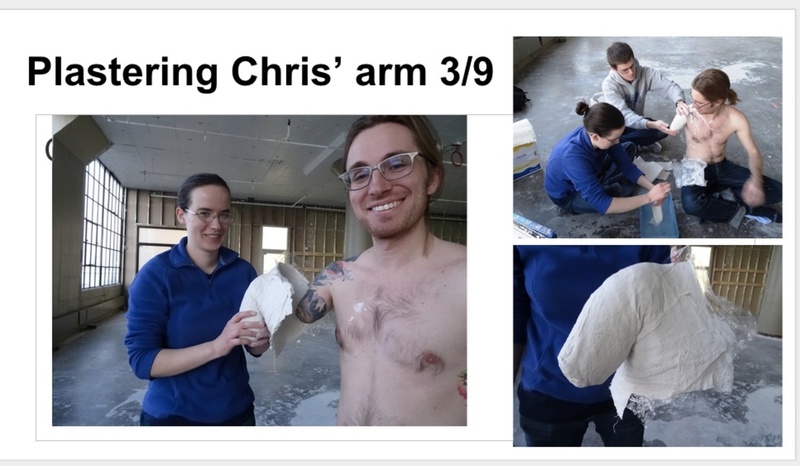 Students measure Chris’s arm for proper fabrication. Students made a solid rubber mockup of the limb from the casting. Students were able to make quick sketch models using the rubber mold. A CAD rendering of the socket prototype’s modular structure. A close up of the CAD rendering showing the compression-style fitting of the socket prototype. Team extension tested out wearables for the leg in addition to the climbing arm. Chris discusses the features of a metal leg wearable. Chris braces the prosthetic arm against a climbing wall rock—a nice first prototype to learn with. The socket has so far been most useful as a snap-on for a physical therapy extension. He can load the arm to combat some of the muscular atrophy in his shoulder. Below is a video on the socket model, written and produced entirely by the student team, telling the story of their collaboration (CC available, and description on YouTube). 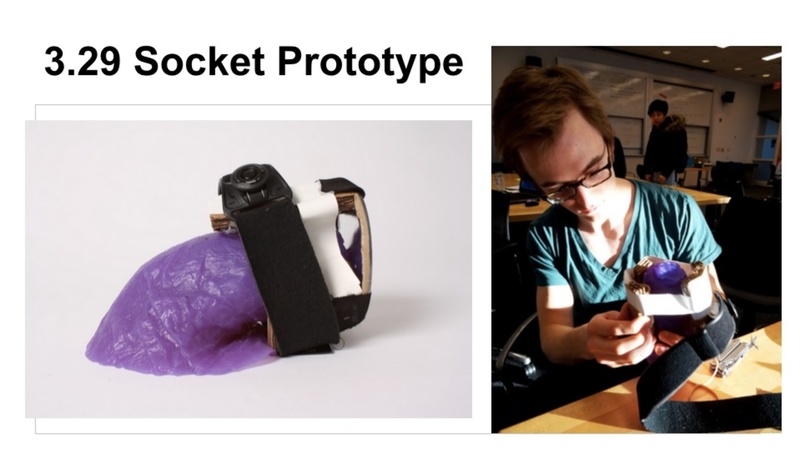 The socket group also presented their work at the Open Hardware Summit in September 2015.